The best way for physicians to monitor and improve their online reviews and attract new patients! Take control and improve your medical practice reputation and physician reputation! How your medical practice is portrayed online and what others say about your practice is more important than ever. Are you controlling the message and what is being displayed on Google, Yelp!, Healthgrades, Facebook, Vitals and rating sites? Reputation Health offers solutions and services to make you look great online and help you grow your medical practice. With our physician online review monitoring solution you have one place to see all reviews, get timely alerts about new reviews with custom reports to send to key staff. Improving your online reviews is simple with our Review Generation Platform. Share positive reviews on your website and get new reviews across all review sites. Make sure your practice can be found and the information is correct on dozens of online directories including Google, YellowPages, Bing, HealthGrades and more! Facebook and social media can attract new patients and help you engage with your current valued patients. We offer a comprehensive solution to grow your practice. Reputation Health is the leader in providing online review monitoring for physicians and medical practices. Our online review monitoring service can track medical practice reviews and physician reviews. 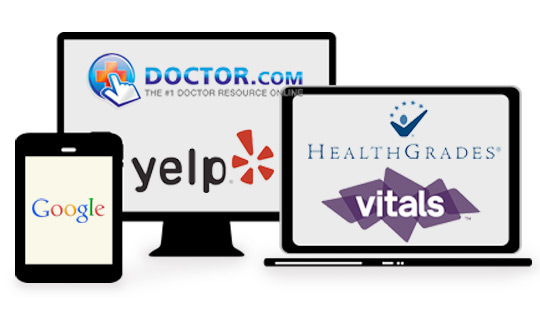 Online review monitoring tracks physician reviews on sites including Vitals, HealthGrades, Yelp, UCompareHealthCare, RateMD’s, Google and more.